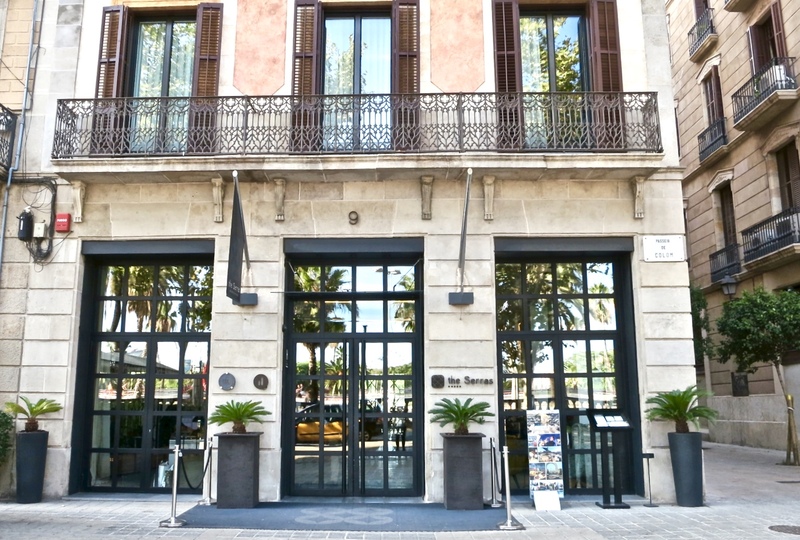 The Serras, a stylish 5 star boutique hotel, is located at the edge of Barcelona’s Gothic Quarter on the tree lined Passeig de Colom and just across the road from the city’s picturesque yacht filled Port Vell Marina. While Barcelona is known for its celebrated architecture, The Serras hotel can boast a bit of celebrity itself. The original architect of the building was Francesc Daniel Molina, who designed Placa Reial, one of Barcelona’s finest squares. The 19th century building is also known as being the site of artist Pablo Picasso’s first studio. In a city known for great hotels, delicious food, and terrific nightlife, how does a visitor decide on where to stay when visiting Barcelona. My husband and I decided to stay at The Serras, not because of its history or being one of Barcelona’s trendiest hotels, but because of its location and its fine reputation for exceptional service. The location is great for exploring Barcelona. The hotel is an easy walk to the waterfront, Las Ramblas, one of Barcelona’s most popular streets and the trendy El Born district. If you don’t feel like doing a lot a walking, the hop on, hop off bus has stops a short walk away for visiting Passeig de Garcia, the famous avenue known for high end shopping and many of the city’s famous landmarks such as Sagrada Família. The airport is a short 15 minute taxi ride away from the hotel. Arriving early in the morning from Barcelona’s cruise port, we were instantly greeted, our luggage gathered from the taxi, shown into the reception area and welcomed by the concierge team. We were offered a refreshing washcloth, a cold glass of cava and chocolates, quickly checked in and our luggage stored. We were given a tour around the hotel, then given a map and suggestions of places we might enjoy visiting until our room became available. The stylish decor is a combination of Mediterranean modern and cosmopolitan New York loft. The fresh modern look of steel, light woods, mirror and glass along with neutral colors of white, black and browns are combined with mustard and blue upholstered sofas and chairs, creating a striking yet relaxed, comfortable feel. The library and bar called Le Nine is located on the mezzanine which overlooks the lobby and restaurant. It is a nice place to relax with a morning coffee or a cocktail before or after dinner. The Serras is well known for its beautiful roof top terrace and cocktail bar, El Sueño. The view couldn’t be better as it overlooks the Port Vell Marina and the Mediterranean beyond. It is a delightful place to enjoy an afternoon cocktail, have a few tapas or relax on one of the lounge chairs around the little plunge pool. We returned from a morning of exploring some of the narrow streets and passages in the medieval Gothic Quarter that lies just behind the hotel and were shown our room. Our Grand Deluxe room had a kingsize bed (the mattress is the same as those in Buckingham Palace, no less), a cozy lounge area with a large TV, a desk with an iPod dock and a smart phone to use during your stay. The bathroom had a large walk in rain shower and the room had a minibar with a Nespresso coffee machine and a tea maker. On a table next to the floor to ceiling windows and balcony that looks out towards the marina, there was a bottle of chilled cava, some tapas and a welcome note from the staff. The hotel’s restaurant is called Informal, with a kitchen led by Michelin starred chef Marc Gascons, owner of Els Tinars in Girona, Spain. The team he has put into place creates Catalan cuisine with a creative twist in an open kitchen. As foodies, we enjoyed watching the chefs prepare the evening meals. Directly behind the dining tables, large glass windows look out at a side street where people watching vies for your attention between courses. The food is excellent, so good we dined there two nights out of our three night stay. All too soon our visit to Barcelona was over. After packing, we headed down to breakfast while the concierge team collected our luggage. After checking out, the team loaded the luggage into a waiting taxi they had ordered for us the night before, we said our goodbyes and headed to the airport. The Serras is a beautiful hotel with a terrific staff. The front door man always greeted us by name and inquired if we were enjoying Barcelona, the concierge team offered helpful suggestions, the food and beverage manager made sure we had a table when we wanted to dine a second evening at the Informal without a reservation, and the kitchen team dealt with special requests and treated us to a delicious dessert, they were all special. Of course there is also its perfect location, the lovely room, afternoon cocktails with a splendid view on the rooftop terrace and the complimentary smart phone with local GPS to use so that we never got lost in Barcelona…my husband and I loved everything about our stay. As a matter of fact, my husband refers to it as the nonexistent “perfect hotel”. I hope one day you too will get a chance to discover The Serras, it really is one of Barcelona’s top boutique hotels. This entry was posted in food, lifestyle, photography, travel, Uncategorized and tagged Barcelona, Barcelona's top boutique hotels, luxury hotel in Barcelona, Pablo Picasso's first studio, spain travel, The Serras, top boutique hotel in Spain. Bookmark the permalink. I agree with your husband about this being the perfect hotel. Wonderful! Have a super weekend Karen. What a wonderful hotel. And I do love the history! Sounds a perfect location. I haven’t been to Barcelona for years but it’s a fabulous city full of so much to do and see. That looks like a lovely hotel and it’s definitely an excellent location in Barcelona. You can get to the Ramblas, Barceloneta, Borne and Barrio Gotico in a few minutes, not to mention the great view. I used to live a couple of streets up from there in Carrer de Milans. Such a beautiful place to stay in Barcelona! Thanks for sharing, Karen. What a lovely experience for you. I have heard that Barcelona is a wonderful place to visit and your description reinforces that view. Definitely, this is the hotel to book. I love Barcelona and this hotel sounds close to perfect!! This sounds like a great hotel Karen. I’m glad you had a great time. I can’t wait to read about your next trip. On our bucket list. Really love that roof top bar in the hotel. Looks really cozy. Great atmosphere. We’re in the throes of planning a graduation trip to Spain so I’m glad to know about this hotel. Oh my goodness Karen. What a wonderful looking hotel and it sounds like a great place to visit when in Barcelona. What a beautiful hotel–it would be such a treat to stay there! Your photos are so nice, too! Oh Karen – between you and Mad I have a plethora of reasons to make up for the fact I STILL have not been to Barcelona: Gaudi et al 🙂 ! Good position, pleasant offerings: a most comfortable place to go on the ‘list’ ! the Hotel looks beautiful !! and love the pictures, really nice! Sounds like a dream! As I’ve said before, you and your husband certainly know how to travel! Beautiful hotel and it looks like the accommodations are quite comfortable. Those El Sueño’s lounge chairs are calling my name! One day, Barcelona will be my vacation spot too! Love this post Karen. We took a trip to Barcelona about 12 years ago and have a been wanting to go back. If we do, we will definite check the Serra’s Hotel especially since you gave it a triple “A” grade!! We love coming to your blog! The hotel looks incredible. This post makes me want to visit Barcelona. What a dream. Barcelona is also on my bucket list of vacation destinations. I hope I can get out there to experience it myself one day, but your photos are a wonderful little taste in the meantime! The hotel looks beautiful with impeccable service. I hope to revisit Barcelona in the near future! Thanks for sharing Karen. What a rich history the Serras Hotel has as well as looking to be a top-notch hotel. I believe I might tend to spend too much time at El Sueño as I love a great view while enjoying a libation. We too would love to set and watch the chefs perform their magic at the Informal. Thanks for taking us on this grand tour of the Serras Hotel. Your enthusiasm makes this look really tempting — almost sounds like a brochure or advert in a travel magazine, you have so many details. It really sounds convenient and luxurious. How wonderful to be able to travel so extensively, Karen. Barcelona is beautiful! Looks absolutely delightful! I have to confess, I haven’t been to Barcelona although it’s been on my ‘list’ for years. And now I know where I’m going to stay… thanks! We always choose for the location when we travel, although we rarely stay in a hotel these days mostly because I like to cook when I travel. This hotel seems to be perfect in every way – I love how the 18th-century exterior belies the clean-lined, modern interior. Exquisite combination of aesthetics. And you were actually able to leave this hotel to do some exploring? 🙂 I would find that quite difficult after browsing through your pictures. What a lovely place to rest your feet after a tour of the city. Wow! That’s an impressive hotel in a magnificent city. So much to see and do. Me gusta mucho Barcelona! The Placa Reial and Ramblas were always a favourite place for people-watching and tapas. And The Serras looks gorgeous! Barcelona is my favorite European city hands down. I spent a month there when I worked on the Summer Olympics. Everything Gaudi was magical. The only thinking missing was this fabulous hotel. I believe I am overdue for a trip to Barcelona. Thank you for letting me about your great experience at this hotel. What a wonderful trip! I have never been to Barcelona, but I would love to go there some day. This hotel is gorgeous and knows how to treat their guest well! Wow…that hand-written note and charcuterie board sold me! That personalized touch is so awesome, and I’m definitely going to keep The Serras on my radar if (and when) we make it to Barcelona! It looks like a wonderful place to stay. The rooftop terrace is beautiful! Thanks Karen for bringing back those fond memories of Barcelona. What a great city to visit, and I’m pretty impressed with The Serras going by your description. It’s not frequently that one gets the royal treatment like you and your husband did. If I were you I’d send that post to them, it would make them pretty chuffed!! My hubby and I plan to visit Barcelona someday. This looks like a lovely hotel to stay. It’s nice that there’s a rooftop terrace, cocktail bar, and a pool. A city that I hope to visit one day. All about Barcelona is impressive! Fantastic hotel Karen. Barcelona is such a beautiful and buzzing city and I would like to take my family there in the summer. We also love Spanish food, so Mediterranean, fresh and tasty. Love at first sight! Those windows! Such a wonderful trip! Just lovely, glad you enjoyed. I would love to go back to Barcelona, it was a beautiful city even though it poured rain the entire time we were there. We stayed in an apartment just around the corner from The Mercat de Sant Josep de la Boqueria. It was wonderful to feel like we actually lived there. Sadly, JT had sprained his ankle as we were leaving my Aunt’s place in Budapest so walking around the old city was a bit challenging. Another reason to return. This hotel looks like a real show-stopper and I like the reference to Picasso. Last year, I spent 5 weeks in Madrid and then last-minute cancelled my plans to stop over in Barcelona before returning home. I’m glad I did, due to the carnage that then occurred. Barcelona is my favorite city and I often tell my hubby that I want to retire there. Next time we go, I’ll have to stay at this hotel because it does look absolutely perfect! Barcelona is not far from where I live and yet I’ve never been there! Looking at your photographs and reading your impressions I start yearning a trip to this famous city! The hotel looks like a dream place to stay. Another city on my bucket list Karen…..lovely! What a wonderful review and a great place to recommend to my family who are on their way to Spain next month!